First came 360, launched in 2005 as an early attempt to get Yahoo into social networking, was unceremoniously shut down earlier this year. In 2006 Yahoo was unable to close a transaction with Facebook, despite being willing to pay up to $1.62 billion. Nor could they pull the trigger on a $1 billion Bebo deal (Bebo went to AOL for $850 million). Now Yahoo has shut down Mash, which launched less than a year ago and is best known for sporting a Darth Vader playing guitar and eating a banana image when it was in private beta. 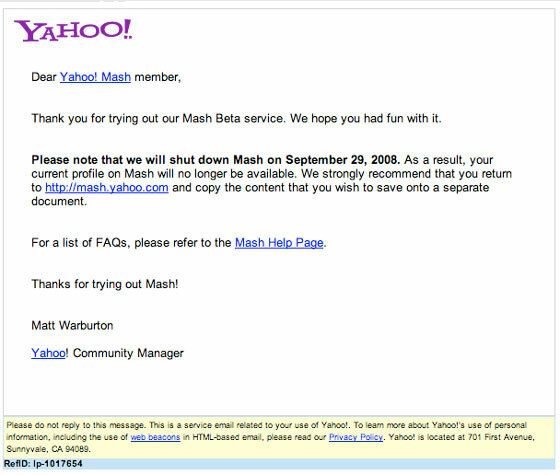 Today, Yahoo emailed users notice that Mash will be shutting down on September 29, 2008. Fifth time’s a charm they say (right?). Let’s hope the next grand strategy works out better than the first four. Meanwhile, Yahoo Mash joins the deadpool.